Newlite offer an aluminium alternative to our existing PVCu range of sash windows. Our up to the minute aluminium vertically sliding sash window is perfect for domestic or commercial projects and offers several advantages of you are looking for a quality aluminium sliding window. Our latest generation aluminium sliding window is suitable for new installations or for the replacement of older sash windows. Our quality sliding sash window in the latest generation thermally insulated aluminium was first introduced into the UK market over fifty years ago. Constantly undergoing a programme of development and enhancement to meet the ever changing replacement window market it is now one of the very best sliding sash windows available. Most other sliding windows on the market are designed primarily for the commercial market. The Newlite aluminium sliding window has several features that make it ideal for the home. A quality sliding window suitable for new windows or replacement of old sash windows. Many properties constructed in the 1970’s have original metal sliding windows. Older blocks of apartments, houses and office buildings are typically those featuring old metal sash windows. Many of these original sash windows have frames without insulation, single glazing or are even coming to the end of their useful life. For any older building requiring replacement sash windows our product is suitable. 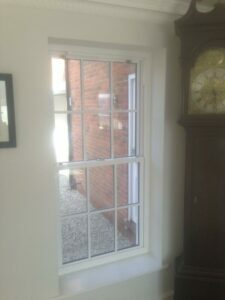 Sash horns are also available to replicate older windows as are deep bottom rails. An authentic looking window with all the advantages of slim and strong powder coated aluminium. For older flats and apartments fitted with original metal windows there is a suitable replacement. Our quality PVCu windows offer a choice of designs, high security and are built to last. Our aluminium sliding window is ideal for homes of any type. Our aluminium sliding sash windows will complement even new build homes. Features of our aluminium sliding sash window. Retractable parting bead replicating the original look of box sash windows. Meets current Building Regulations having a C rating. A choice of slim or deep bottom rails. Easy to install with minimal disruption to existing decoration or plaster. A choice of sash horns. As with all our high quality aluminium products, we offer our aluminium sliding sash window in a choice of over 200 RAL colours. This means you can choose exactly the right finish to match your own particular type of property. High specification glazing as standard. Our sliding window features 24mm double glazed units. We use Diamant low iron glass, warm edge spacer bars, argon gas fill between the glass panes and 4mm planitherm total plus glass with soft coat coating to the inner pane. Contact us for prices and further information. Whether you are looking to replicate the look of your original windows with a like for like replacement or simply seeking the latest in sliding windows with all th advantages of aluminium, contact us for a quotation.